Server virtualization technologies are becoming more popular to help efficiently utilize resources by consolidating servers. IBM® , the first company that developed and made available the virtual technology in 1966, offers advanced, powerful, reliable, and cost-saving virtualization technologies in various hardware and software products including DB2® for Linux, UNIX, and Windows. 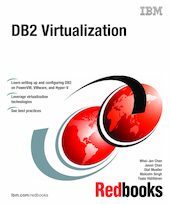 This IBM Redbooks® publication describes using IBM DB2 9 with server virtualization. We start with a general overview of virtualization and describe specific server virtualization technologies to highlight how the server virtualization technologies have been implemented. With this introduction anyone new to virtualization will have a better understanding of server virtualization and the industry server virtualization technologies available in the market. We discuss the virtual machine setup with DB2 in mind to help IT support understand the effective ways of setting up a virtual environment specific for DB2. We explain the architecture and components of these three server virtualization technologies to allow DBAs to understand how a database environment using DB2 can benefit from using the server virtualization technologies. In addition, we discuss the DB2 features and functions that can take advantage of using server virtualization. These features are put into practice when describing how to set up DB2 with the three virtualization technologies discussed in this book. This book also includes a list of best practices from the various tests performed while using these virtualization technologies. These best practices can be used as a guideline or a reference when setting up DB2 using these virtualization technologies.